Adhesion of Vacuum Deposited Films and Coatings. Part 1: Introduction | Management Plus, Inc. Vacuum deposition may be defined as the deposition of a film and coating by atom-by-atom or molecule-by-molecule on a suitable substrate surface. The vacuum is necessary for the transport of the atom/molecule from the source to the substrate by having a long mean path for collision in the vapor state and for controlling the partial pressure(s) of gaseous reactive species in the deposition environment. 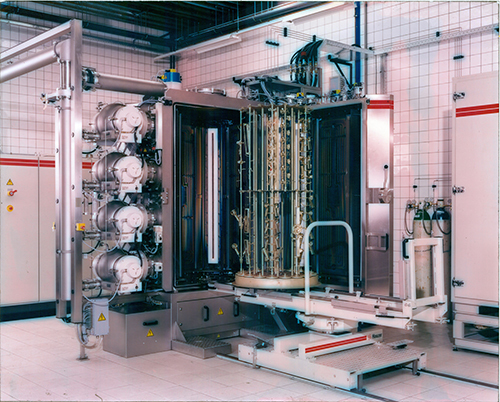 Vacuum deposition may be accomplished by: 1) deposition of vapors from the source material(s) with no reaction on the substrate, 2) reaction of co-deposited materials on the substrate or 3) reaction of the deposited material with the gaseous environment (“reactive deposition”). Vapor sources include: 1) thermal evaporation or sublimation from solid or liquid, 2) sputtering from a solid cooled surface, 3) vaporization from an arc moving over a solid surface, or 4) decomposition of a chemical vapor precursor. In some cases a low pressure plasma may be used to “activate” reactive species and/or provide ions for concurrent energetic particle bombardment of the depositing species (sometimes called “atomic peening”). The terms “vacuum deposited thin film” and “vacuum deposited coating” are used in the literature without any definition of the thickness or mass per unit area. Early use of vacuum deposition was to deposit films for reflecting and antireflecting films both of which require film thicknesses on the order of a quarter of the wavelength of visible light or about 150 nanometers. This seems to be a logical upper limit for the thickness of a vacuum deposited thin film. At this thickness the physical and mechanical properties of the film often are not important for adhesion. As the vacuum deposit becomes thicker it would be logical to call them thick films but this terminology has a specific meaning in hybrid microelectronics. Therefore the term coating seems to be a good compromise. The properties of the coating may have a significant effect on the adhesion of the coating to the substrate. Adhesion is the mechanical strength joining two different materials (designated A and B) and is a fundamental requirement of most vacuum deposited films and coatings. In a few cases such as fabrication of free-standing structures, the adhesion may be made deliberately low. The loss of adhesion is sometimes called deadhesion in adhesion technology. Fractures are caused by mechanically stressing the interfacial region thus providing energy for fracture propagation. Fractures may be classed, as brittle fracture where there is little plastic deformation and comparatively little energy is needed to propagate a crack in the “brittle” material. If the fracture involves significant plastic deformation to separate the surfaces the failure is called ductile fracture and requires significantly more energy to propagate the failure. In brittle fracture often very little energy must be added to propagate the crack while in ductile fracture more and continuous energy must be supplied to propagate the crack. A material that is both strong and ductile is often called a “tough” material. Corrosion may enable fracturing by embrittling the material at a crack tip such as is the case with moisture at the crack tip in glass, (a glass-cutter will scribe the glass, then wet the scratch, before applying the stress needed to break the glass)  or by “wedging” of the crack by corrosion products. Fractures may be “blunted” by having the propagating fracture encounter a “tougher” material or by having to change the direction of propagation because of a change in the stress vector. In vacuum coating, generally fractures are caused by mechanical stresses applied to the interfacial region. If the stress is normal (perpendicular) to the plane of the interface it is call a pure tensile stress. If the stress is parallel to the plane of the interface the stress is call pure shear stress. Of course the applied stress usually will have both a tensile and a shear component due to the direction of the applied stress and/or the roughness of the interfacial region. The stress that appears at the interface is composed of intrinsic stress and extrinsic stress. The intrinsic stress is the “grown-in” (growth) stress due to the deposition conditions and may vary through the thickness of the deposit. The extrinsic stress is due to external factors such as differences in the coefficient of expansion of the substrate and coating material. The total value of these stresses depends on the thicknesses of the stressed regions. Very thin films may have high stress but still be adherent whereas thick deposits may have such a high total stress that there will be spontaneous deadhesion. For example chromium is often used as a “glue” layer for metallization on glass. Vacuum deposition by thermal evaporation will give a high tensile stress and up to several tens of nanometer thickness will exhibit good adhesion while hundreds of nanometers will cause fracturing in the near-surface region of the glass. Fractures in brittle materials often have point of fracture initiation where there is a defect or where stresses are concentrated. Microcracks or scratches in the surface of a brittle material, such as glass, are an example of fracture initiation sites. Deadhesion may be local, creating “pull-outs” or “pinholes.” Common sources of pinholes are dust particles and “spits” or “macros” from arc vapor deposition. The pinholes may act as initiation sites for further fracturing. Other types of time-dependent stresses such as interfacial corrosion may cause deadhesion. Deadhesion by weakening of the adhesion bonding may also result from diffusion to or from the interfacial region by chemical species or structural defects such as voids. In some cases diffusion may result in strengthening of the adhesive bond. Designing for adhesion in vacuum deposition requires an understanding of the substrate and coating materials involved, their interaction, and how the deposition process influences their properties. This in turn requires an understanding of the condensation and nucleation of the depositing material, the interface formation and the nature of the film growth. Even monolayers of contamination may influence nucleation and growth so control of contamination prior to and during vacuum deposition is important in having a reproducible vacuum deposition process. This entry was posted in Uncategorized on January 15, 2019 by admin_29823.